The Sect 360 is the largest portion cutting machine. With its servo-controlled product feed and smart control system, it is possible to portion the product into groups with the consistently identical or at choice varying slice thickness. First-cut control and batching options are other functions that guarantee and optimize yield. 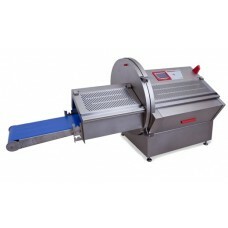 The integrated discharge conveyor enables simple and swift product handling after slicing.